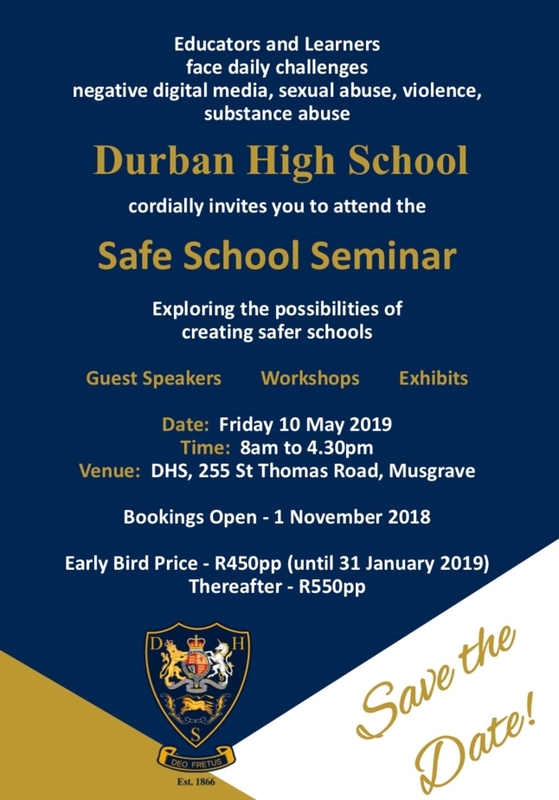 This section of the website is devoted to significant surrent news about Durban High School, and to the activities of the DHS Foundation, which provides financial and other support to the school. More detailed information can be found at the school website, www.durbanhighschool.co.za. The much anticipated announcement of Tony Pinheiro as the new Headmaster of Durban High School has been released by the Department of Education. Seen as one of South Africa’s leading high school educationists, Mr Pinheiro will take up the new appointment on 18 April 2017. Mr Pinheiro started his teaching career in 1992 and joined Glenwood High School in April 1994. As the Senior Deputy Principal at Glenwood High and the Head of the school’s Gibson House Boarding Establishment, Mr Pinheiro has had a significant impact on the young men that have passed through his hands during this period. He is married to Colleen, a highly respected educationist herself. His daughter, Cassandra, is in her final year as a Bachelor of Science student at Stellenbosch University, whilst Dominic his son, is currently in Grade 12 and a Prefect at Glenwood High School. Mr Pinheiro is an avid reader and accomplished chess player and enjoys both sport and travel. He has a Bachelor of Education (Honours Degree), and has a particular interest in Educational Management and Law. Mr Pinheiro has acted as the Headmaster of Glenwood High since February 2016, and will bring a wealth of experience to his new position as Headmaster of Durban High School. 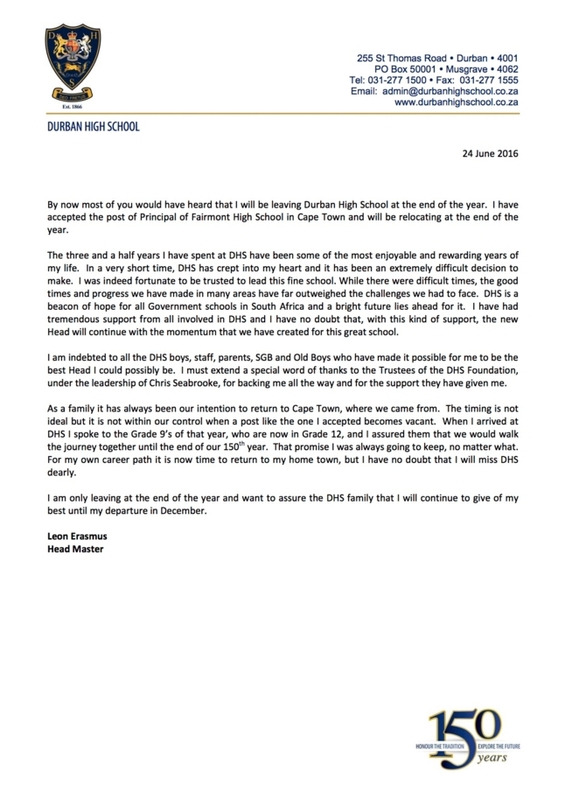 Highly respected by all the young men who have experienced his leadership skills, Mr Pinheiro will no doubt have a significant impact on the future of Durban High School. He will team up with the former Head of Glenwood Preparatory, Mr Louis Ardé, who was recently appointed CEO of the DHS Foundation. These are indeed exciting times for Durban High School, and the staff, pupils and Old Boys, all extend a warm welcome to Mr Pinheiro and wish him every success in the future..
After seeing the School through its 150 Year Anniversary celebrations, as he had promised when he was appointed less than four years ago, Headmaster Leon Erasmus has resigned his position in order to take up a new appointment in the Cape. Mr Erasmus was highly regarded during his brief tenure. His resignation announcement is below. The School Governing Board has announced that Jiggs Gray's name has been removed from the school mathematics prize. 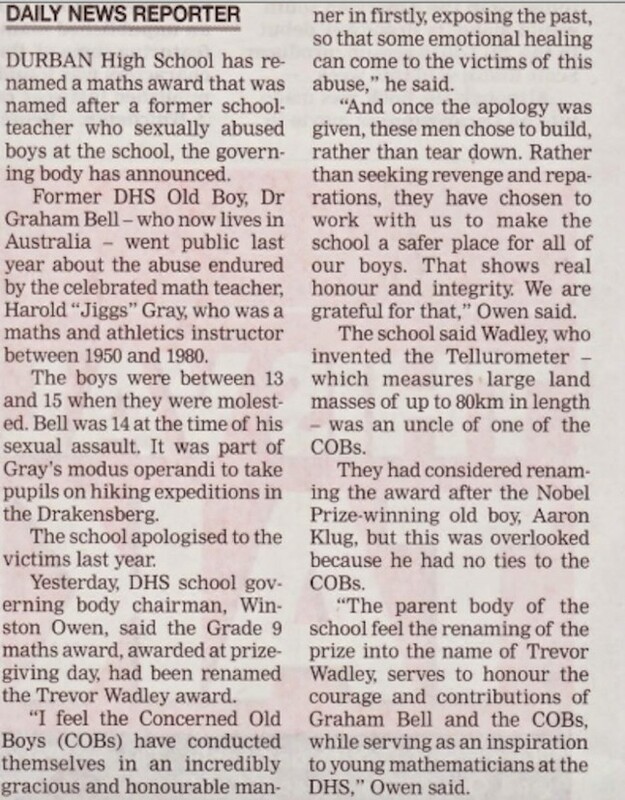 It will be replaced by the name of Trevor Wadley, an old boy of the school and a distinguished electrical engineer (see https://en.wikipedia.org/wiki/Trevor_Wadley). Over the 3-week July holiday, the Durban High School Boarding Establishment, Blackmore House, which is home to about 120 boys at present, underwent a much needed refurbishment. The revamp of the interior of the house was undertaken by Taylor'd Interiors, a Morningside based company that is owned and managed by Vanessa Taylor. Her vision for the house was clean, neat, tidy and modern. The exterior of the building was completed by Gordon Verhoef and Krause, the leading specialists in building, renovation and recycling of buildings. The DHS Foundation has celebrated a windfall in that the sale of the property which currently hosts the DHS Old Boys Club and some lessees, has been sold for R50m – R5m in excess of what was originally anticipated earlier in the year when the call for proposals was networked extensively internationally, nationally and to the Old Boys network to ensure that as many as possible had the opportunity to put forward a proposal. The property which measures 4,3 hectares (43 000m2) and is flanked by Marlborough Crescent and Gainsborough Drive in Durban North has been sold to a private developer, whom together with other tenderers, was subject to a stringent adjudication process by the Foundation and attorneys Garlicke and Bousfield. The evaluation of the proposals took purchase price, satisfactory financial guarantees, deposits, acceptable and realistic land usage, sustainability of the proposed project and effects of the proposed development on the neighborhood into consideration. The transfer of the property is subject to the successful completion of an Environmental Impact Assessment (EIA), rezoning of the property from Private Open Space to Residential, and various other statutory requirements being met, all of which the developer has until January 2016 to complete. The intended usage for the property is for a low density, up market residential development and a spokesperson for the developer has confirmed that every effort has been made to take the environment into consideration with only twenty nine percent coverage of the site, and the remaining seventy one percent being open space and waterways. In keeping with the property’s significant history, in that it was purchased as a memorial to Old Boys of the school who had fallen in the First and Second World Wars and was subsequently developed as a sporting and clubhouse facility for DHS Old Boys, the developers have allowed for a servitude over the property in which a War memorial is to be erected. Included in the proposal submission by the developer was an initial traffic study, but a full Traffic Impact Assessment will be required prior to any development approvals being granted for the site. A representative from the Foundation will attend all development meetings to ensure that due process is followed and that there are no unreasonable delays. The process is also intended to be fully transparent in that there will be public presentations and neighbours will have the opportunity to comment on the proposed development. The DHS Foundation has been established to generate financial support for DHS through a partnership with the school community of Old Boys, parents, staff and pupils. The Foundation aims to ensure the continued growth of DHS as a centre of excellence, learning and opportunity. The Foundation seeks pledges of support, whether it be financial or in the form of sharing expertise, in order to ensure that the strategic objectives of Durban High School are met now and in the future. Durban High School strives to develop responsible, motivated young men with strong moral convictions and integrity, who, possessing self-discipline and courage are capable of leading with strength and compassion to meet the challenges of the future. Our ethos enables us to realise individual potential in Academics, Sport, Cultural Activities, Leadership, Outdoor Experiences and Service to the Community. We pride ourselves on achieving this by the nurturing of loyalty and respect, the honouring of all relationships, and through a commitment to hard work, in a secure environment which embraces the diversity of South Africa. The objective of the Foundation is to assist in the regeneration of DHS as the pre-eminent boys’ high school in Durban. The purpose behind the objective is to participate in the reformation of scholastic education in order to achieve school leavers who are not only functionally literate and numerate but who have benefitted from a broad education that will equip them with life-skills that will be relevant in their choice of careers. A sad reality of so-called government schools is that the funding for the provision of education is woefully inadequate – DHS, by way of example, receives approximately 17% of its annual income, funded by the Department of Education; the balance needs to be sourced from students’ fees and fund raising by the school. The source of funds derived from students’ fees is a constant nightmare as many pupils qualify for a reduction in their fees. Fund raising on the part of the school has been very challenging and for some time now has been inadequate. The shortfall has been funded by The Durban High School Foundation Trust. Now, while the Foundation is quite prepared to continue some level of funding, it has become apparent that it is most ill-advised for the status quo to remain. Something has to be done. It is the considered opinion of the board of trustees of the Foundation, in conjunction with the school’s governing body, that a different approach needs to be embarked upon to encourage an improved student diversity, who understand that a school cannot exist unless its costs are paid for. The reality has to be faced that quality education has to be paid for. The Foundation’s trustees believe that improved and enhanced school facilities will attract pupils from families who are not only in agreement with the principle of paying for quality education but who also have the capacity to meet this commitment. In addition, cognisant of the need to support and encourage pupils from less financially secure families, who have the potential to achieve commendable levels of academic and sporting achievement, the Foundation must acquire the capacity to fund relatively significant numbers of bursaries. The challenge will be to manage the appropriate ‘mix’ between fee paying students and those students who benefit from Foundation sponsored bursaries. Given the necessary financial capacity, it is the fervent hope of the trustees – and I am sure, that of all Old Boys – that the school will attract a suitable mix of really fine pupils who will develop and thrive academically as well as in the various sporting fields and cultural activities. The initial project is to refurbish Blackmore House, which has been allowed to deteriorate to an unacceptable level. The budget for this refurbishment is estimated to cost in the region of R2.5 million which will include some fairly substantial re-wiring. One of the anticipated benefits, apart from the obvious improvement in the conditions for the occupants, is that it is believed that a refurbished boarding establishment will encourage pupils from areas other than the immediate environs of DHS, to join DHS as boarders. As places at Blackmore House are subject to interviews by the management of DHS, care can be taken that the applicants will be demonstrably capable of meeting their financial commitments to the school. Emphasis will also be placed on the potential for academic, sporting and cultural prowess. Without attempting to sound elitist, the reality of life is that the adage “success breeds success” will continue to apply. Another goal of the Foundation is the general upgrading of school buildings. The plan for a dedicated Mathematics and Science Centre is being developed and it is also anticipated that the IT Centre will be upgraded. Our appeal to those Old Boys who have benefitted from a sound secondary school education at DHS, and who entertain an awareness of their need to reflect upon their success in life, is to identify with this very worthwhile enterprise. Help us ‘make a difference’ by restoring DHS as a school of excellence. We want to produce an ever increasing number of high achievers who will in turn contribute to the growth and development of this beautiful country, so that in another 50 years, Old Boys of the day can reflect with pride that DHS has continued to uphold its legacy of producing not only leaders and high achievers, but also a solid body of ‘boys’ who are the salt of the earth, imbued with a sense of pride in their own achievements as the ‘product’ of a really fine school. And your grandchildren can also bask in the pride of knowing that your contribution made that possible. The 200-year anniversary celebrations will include your name in pride of place among the benefactors who helped to restore DHS to its historical place as the top boys’ high school in Durban. Who knows, maybe it will be a co-educational school by then, but whatever its student body classification, it will remain the school to be proud to call one’s Alma Mater. You would provide a legacy for your grandchildren in the widest sense, in that you would be contributing towards the uplifting of educated youths in general – albeit on a smallish scale – using the medium of Durban High School, which will perpetuate the image of ‘School’ as a beacon of secondary school education in Durban. Last year, three Old Boys made a most commendable commitment. Stephen Saad, Christopher Seabrooke and Howard Buttery each committed R1 million per year for 3 years to the Foundation. They have appealed to the Old Boys’ fraternity to join in this most worthwhile endeavour and to donate funds generously. In addition to lump sum payments that some Old Boys may be able to provide, there will be many instances where Old Boys feel it will be more suitable to make monthly payments. Stephen Saad has expressed the hope that as many as 3000 Old Boys will commit at least R100 per month, for 3 years, to the Foundation. Old Boys will be well aware that donations towards the Foundation qualify as a deduction in terms of the Income Tax Act. If you are willing to contribute to the Foundation, you can simply go to the Foundation’s website (see above) and click on “Fundraising” and then “Pledge Now” and enter the details on the form and email Liz Foster. All contributions will be acknowledged and recorded for posterity. 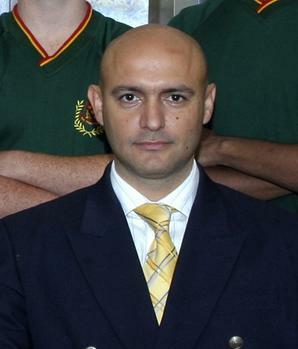 Mr Leon Erasmus as Principal of Durban High School, effective from 8 April 2013. Leon is joining the DHS family from Rondebosch High School in Cape Town, where he has served as Deputy Principal since 2004. Leon has gained exceptional leadership attributes having had experience in many areas of educational responsibility at a leadership level, including representation on Governing Bodies over the past eighteen years. He is passionate about education and the moulding of youngsters into future leaders. Leon was schooled in Queenstown before joining the education profession. He was then appointed HOD at Queens College and subsequently promoted to second Deputy Principal. In 2004, he moved to Rondebosch Boys’ High School where he took up the post of Senior Deputy Principal, a position he has held for the past eight years. Leon also has an outstanding organisational and managerial track record within secondary education, believing in dynamic leadership whilst still being approachable and a good listener. He also has experience in performance assessment, academic curriculum, educational legislation and human resource management, external evaluation, whole school evaluation and has sat as chairman on a number of school committees. He has a Degree and a Diploma in Education from the university of the Free State. Leon is an avid lover of sport and its role in the development of boys at high school and has coached sport at provincial and national level. He is married to Elmarie, also an educator, and they have two daughters, Chanel, who is studying in the USA and Cassandra who is in Grade 8. Both have already proven themselves on the sports fields. The Durban High School Governing Body congratulates Leon on his appointment and wishes him every success in the significant role he is to perform as Head of Institution in the future of DHS.